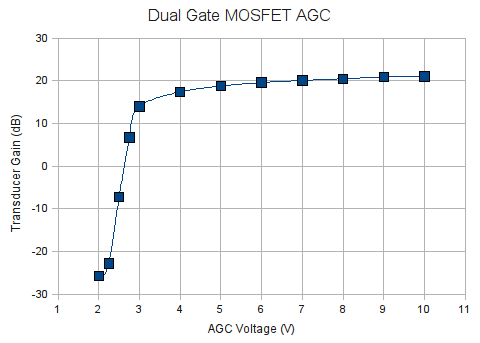 Having determined some basic characteristics of the biasing of the BF998 dual gate MOSFET in a previous experiment, it was now time to look into the gain and AGC performance of the amplifier. A few changes were made to the original circuit to turn it into a proper RF amplifier. The gate 1 voltage (VBIAS) was initially biased to 3.16 V, a level that was previously determined to give about 10 mA of drain current when gate 2 is biased to 9.2 V. The input signal was set to a frequency of approximately 28.1 MHz, to give an idea of the amplifier performance in the upper HF bands. The output power of the signal generator was set to -30.0 dBm into a 50 Ω resistive load. This gave me enough power to make a good measurement with the FPM-1 while avoiding the problem of gain compression. All gain measurements are based off of this amplifier input power (in other words, the amplifier gain described in this report is the transducer gain). The DC biasing of the circuit is virtually identical to the final configuration determined in the first experiment. However, there have been some changes in regard to the input and output circuitry. First of all, the gate 1 bias is now fed through a 2.2 kΩ resistor which is bypassed to AC ground with a 100 nF capacitor. This sets the input impedance to 2.2 kΩ. Values around 2 kΩ seem to be fairly common in the literature, apparently because of the noise figure benefits. I would like to investigate this further in a later experiment, but for now we’ll go with the wisdom of others. A typical L-network was placed on the input to transform the 50 Ω amplifier input impedance to the 2.2 kΩ impedance that gate 1 wants to see. The drain inductor was replaced with a 10:2 ratio transformer to give the drain a load of 1.25 kΩ to work into when a 50 Ω load is placed on the amplifier output. Again, this is another area where I decided to go with the wisdom of others. This drain load values seems reasonable based on other FET amplifiers I’ve used, but it might also be an area worth investigating later. Under the initial conditions described above, I measured an output power of -6.1 dBm, which indicates a transducer gain of 23.9 dB. This seems like a reasonable and believeable amount of gain from a single amplifier given the biasing levels established. I decided to vary VBIAS a bit to determine the point of maximum gain for the amplifier. At a gate 1 voltage of 3.43 V, I measured -5.9 dBm of output power, or a gain of 24.1 dB. There is a slight amount of difference between the two voltages, but not enough to be significant. It seems that the initial estimate worked fairly well. Next, the circuit was modified slightly to examine the AGC characteristics of the BF998. Both the source and gate 1 were biased to approximately 3 V using a blue LED. This biasing method is very convenient, simple, and stable, even if it may not bias gate 1 to its ideal point. This reduced the drain current to 6.6 mA, which would mean a slightly lower maximum gain, but also would be a more power-efficient way to run the amp. I could have used two red or green diodes in series, or a string of small-signal diodes as seen in the Hybrid Cascode amplifier, but the blue LED uses the least parts (and is pretty to boot). The fixed voltage divider bias was removed from gate 2, and in its place a variable AGC voltage (VAGC) was applied. The same -30.0 dBm input power was used, and the output power was measured at different settings of VAGC. As you can see in the table and chart below, there is a large AGC voltage range with very little gain variation, then a sharp knee where there is a steep slope of gain reduction. The knee occurs at an AGC voltage of about 3 V. Between 2 V and 3 V is the largest gain variation (about 40 dB). This AGC response curve actually appears to agree fairly well with the curve published in the Philips RF Manual 3rd Edition Appendix for the BF998. The AGC range of approximately 50 dB also seems in line with the data published by NXP. It does look plausible that two of these amplifiers cascaded together could provide nearly 100 dB of gain reduction (another experiment idea for later). Next, I intend to build a return loss bridge (finally!) and get some measurements on this amplifier. I also need to look into what it will take to measure noise figure, and get started on that test rig as well. 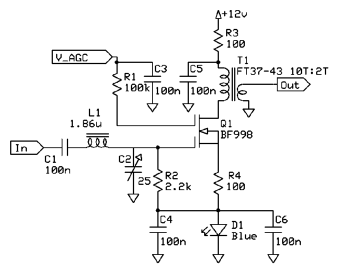 Did you happen to measure the fet Id current / gain dependency ? I have IF amplifier under construction and have plan to base the signal strength indication to fet Id current value which I believe is more linear in relation to gain reduction. I did not make the variable drain current measurements that you have described, but that would make for a great follow up experiment. 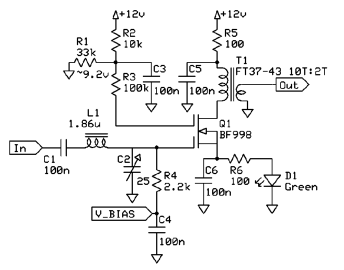 The intriguing thing about dual-gate MOSFETs is the different ways that you can bias them. If you get around to that experiment before I do, please let me know what you find. Hi Volker, not sure you solved your problem alrrady… 🙂 I spent the evening doing exactly the same simulation and when finished I looked at what conclusions other people have drawn ( my simulations came to the same result more or less to what is described abobve ). In your model above you need to take away the L’s and the C’s. I dont know to write spice model(large signal model) for below S-parameters. Please send me the model.